In Clash Royale, Fire Spirits is an outstanding cards with low Elixir cost and can target both air and ground units. Added in the last update, Fire Spirits were a brand new card with a unique mechanic. They kill themselves! While technically troops, their function is comparable to spells and have even earned the title “pseudo-spells” from various users. Their innate uniqueness and incredible cuteness seems like enough to win over the hearts of the Clash Royale player-base, right? Wrong! Let’s take a look to see how to use it properly guys! Thanks RotomGuy for sharing these tips at here. 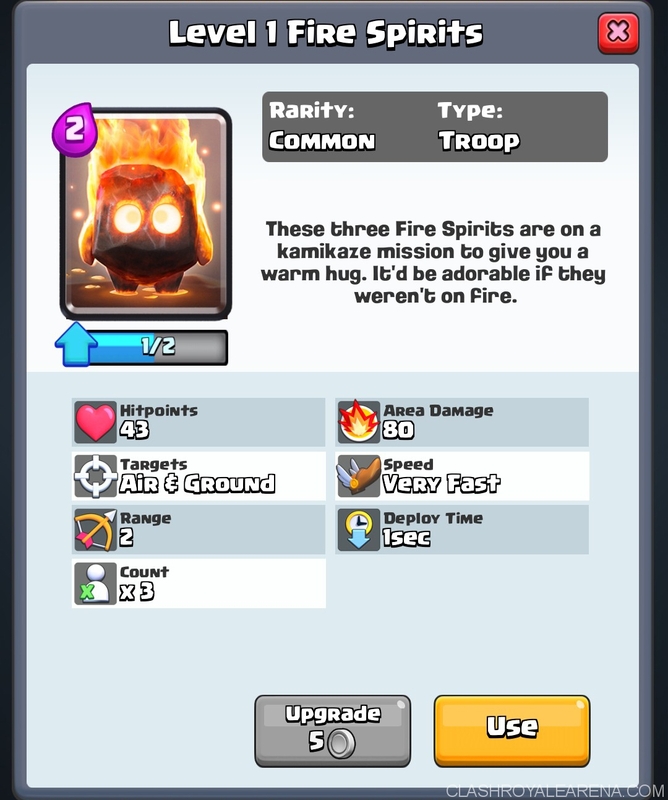 Fire Spirits are, as you probably know, Kamikaze units. Like other ranged units, Fire Spirits have a range at which they can shoot their projectiles. However, they are the projectiles! They fire one big fireball and then die. At Tournament Levels (9), Fire Spirits have 91 HP each and deal 169 area damage each. This means that the opponent’s towers cannot kill them in one hit! But HP is not really the most important factor here, since your Fire Spirits should rarely receive damage anyway. The only way they should be dying is suicide! As such, what we want to pay attention to here is the damage. At 169 damage each, they are essentially a Level 9 Wizard Fireball each. We all know Wizard Fireballs hurt, especially at Level 9. So imagine 3 of them, in quick succession. Fire Spirits are the best AoE cards in the game taking Elixir Cost and Damage into account, the only thing you need to do is get them to their destination alive. Most likely, you all know about the defensive capabilities for Fire Spirits. However, using them in a way to reach these capabilities isn’t always easy. These two cards are basic aerial units with low HP. But despite their weaknesses, they are easily one of the most widely used cards in the entire game. Arrows are a well-known hard counter to both, but not every deck uses Arrows. Plus, Arrow Bait decks can waste your arrows allowing the Minion Horde to wreak havoc on your towers. Fear not, Fire Spirits are here. Fire Spirits are an even harder counter to these two cards than Arrows are. Coming off with a +1 Elixir trade against the former and a +3 Elixir trade against the latter, they work even better than Arrows do. Simply place the Fire Spirits far enough out of reach so that the Minions won’t reach them before their 1 second placement time is up and watch the entire Horde all die, or survive with enough HP to be one-shot by the towers. Barbarians are also incredibly common cards. They can stand up to a decent amount of pain and together, they can do big damage if left alone. AoE is of course the best method of taking them out, and who did I say were the best AoE cards in the game? 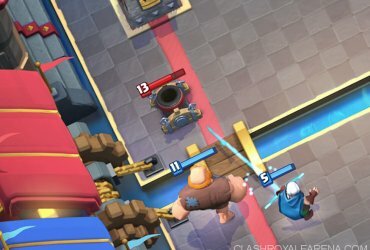 Fire Spirits do major damage to Barbarians leaving them with enough HP to survive, at max, 2 tower hits. That’s a +3 Elixir trade. Placing Fire Spirits against Barbs can be tricky though, as the group can organize themselves oddly. If they’re in their usual square formation, placing Fire Spirits nearby is easy. However, by placing Barbs behind the tower, it causes them to walk in a line. Placing Fire Spirits in front of this line is ineffective as it’ll only damage the first two Barbarians. Instead, Fire Spirits should be placed to the side of the queue so that they’ll run into the 2nd and 3rd Barbarians, often damaging the entire line. 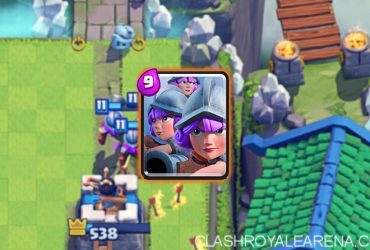 When they reach your side of the arena, it is almost always with another stronger troop, like Hog or Valkyrie. As such, Fire Spirits are a very good choice for taking them out while they’re together in a group. The Fire Spirits will kill them and deal significant damage to the troop they were together with. Fire Spirits should be placed out of range so that they can spawn without dying, and then go on to wipe out all the precious calcium. Guards included. The first two should destroy the shields and the last one should kill the spoopy skeletons hiding beneath. Goblin Barrel is a rare card but Fire Spirits are a hard counter. If the Goblins are bunched up in one place, one Spirit will kill all 3. But if the card is playing correctly and the Goblins are each on different sides, the Spirits will abandon their usual jump-even-if-one-of-my-brothers-is-going-to-kill-anyway mindset and each go for a separate goblin. Balloons can be panic-inducing since they’re usually played behind a bigger unit or when the opponent has realized you don’t have much Elixir to stop a Balloon push. Well, with Fire Spirits being so beautifully cheap, the latter should almost never occur unless they aren’t in your line-up. Fire Spirits take a huge chunk out of a Balloon’s HP. No other troop can do this much damage to a Balloon this quickly for such a low cost. Now we’re getting into the territory of the troops you probably shouldn’t be playing Fire Spirits against, but if you must, this is how. These are all ranged AoE units, the defensive Fire Spirit’s worst nightmare. The best way to allow Fire Spirits to get a hit in is by distracting them with another cheap troop. While this will cost more than just 2 Elixir, Fire Spirits do tear into the HP bars of all of these troops allowing to be taken out by a tower before they do too much harm. While Fire Spirits are nowhere near a counter to the Prince, playing them well can hugely decrease the amount of damage a Prince can do if you can’t stop them with anything else. When a Prince is charging, place Fire Spirits toward the middle of the arena so that the Prince will reach them before the 1 second placement time is up. The Prince will use up his charge damage on one and by the time he can attack again, the other two will be awake and will have dealt good damage to the Prince. The Fire Spirits should be placed so that the Prince’s walk back to the tower is not long enough for him to attempt another charge. Fire Spirits can hurt a Musketeer and can hurt all three Musketeers but they aren’t optimal counters since the Musketeers outrange the Spirits and kill them before they can even spawn. As above, a distraction is necessary. 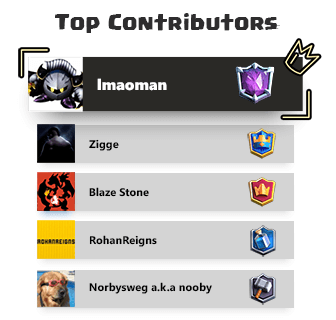 Unfortunately, the larger troops like Giant, Golem, PEKKA, etc. can shake off a Fire Spirit’s damage rather easily. It is more advisable to use a troop/building that can draw the troop away from your tower and/or deal constant damage rather than use Fire Spirits. No, not that kind of offensive! Though, it is an easy mistake to make since using Fire Spirits offensively is quite rare. However, using Fire Spirits on the offensive is surprisingly strong. At Tournament Levels, Fire Spirits are strong enough to survive a hit from a tower with one HP to spare. As such, placing them alone down a lane means that at least one can get to the opponent’s tower if they play nothing. This isn’t exactly a fantastic use of Fire Spirits though since it is better to play them in other ways. However, if all the action is going down in one lane, this can be used to get a cheap 170 damage on the other tower. Almost exactly the same as the above tactic, however you will instead place skeletons first and put Spirits immediately behind the Skeletons. Both will be placed just before a bridge. Despite being basically the same as Singular Spirits, for one more Elixir, the skeletons will absorb all the damage and let all 3 Spirits hit the tower for 510 free damage. For me, at least, the opponent rarely places any troops to stop such a push, instead assuming that the tower will get the job done. Despite the low cost of this tactic, it is easy to stop with a Valkyrie, Arrows, or even Zap for a +1 Elixir trade to them. While the Skeletons do make an effective damage shield for the Spirits, it’s not surprising that mini-tanks like Knight and Valkyrie do the job better. However, this one works slightly differently since both components are equal. While the shield troop’s primary function is to absorb tower damage for the Spirits and let them hit the tower, it can work on the inverse. 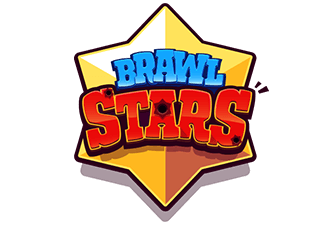 If a troop if placed to try and stop the mini-tank, the Spirits will attack them and dig into their HP bar, letting the mini-tank take them out and go on to deal damage of their own. Another great thing about this push is that the Fire Spirit’s high speed causes them to push the mini-tank toward the tower quicker than they usually walk. Dealing with this push can be tricky since each troop defends the other depending on what is placed to counter it. Defensive buildings however can thwart this push. Tanks like Giants and PEKKAs are at the mercy of smaller troops such as Goblins, Barbarians and Minions. Many carry Arrows and Fireballs to stop them but cards like the loathsome Minion Horde can inflict serious damage before the arrows even reach them. However, placing Fire Spirits behind a tank before they cross the bridge is essentially an automatic Fireball-Arrow hybrid that hits in less than a second rather than waiting for you to react and shoot. Wiping out Goblins and Minions and seriously injuring Barbarians, Fire Spirits behind a tank are very effective. And that there, is a guide on how to use Fire Spirits. For anyone questioning their offensive or even questioning their defensive capabilities, I encourage you to read this post and re-consider. Fire Spirits are such a cute card and i’d hate for them to go un-used just because people didn’t know how to play them properly. Okay so that is the intro of our new card today. Do you like it? I hope we can see a lot of strategies in the future utilizing this awesome card! Stay tuned guys! More guides about the new cards will be released soon!